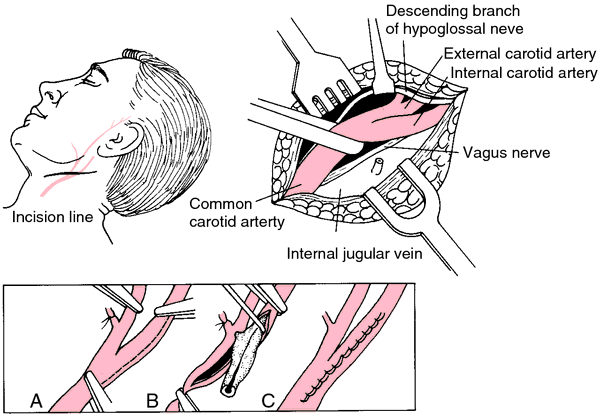 pertaining to the principal artery of the neck (the carotid artery). See anatomic Table of Arteries in the Appendices. carotid endarterectomy surgical removal of atherosclerotic plaques within an extracranial carotid artery, usually the common carotid, done to prevent stroke in patients with 70 per cent or greater carotid stenosis. Patients who have a stroke in evolution or have recently had a stroke are not good candidates for the procedure. Surgery at this time could cause an infarcted area of the brain to hemorrhage when its blood supply is suddenly increased. In addition, there is a low success rate for those patients who have total occlusion of the internal carotid arteries. Patient Care. Immediately after surgery special monitoring is necessary to assess the patient's neurologic status, including level of consciousness, orientation, and motor activity, especially on the side opposite the surgery. Because of the location of the surgical incision, an enlarging hematoma can rapidly produce respiratory distress. Aspiration also is possible because a hematoma can obstruct the trachea and damage the laryngeal nerve, preventing closure of the glottis. Crucial observations include evaluation of neck size, noting the patient's ability to swallow, close observation and measurement of drainage, and measurement of respiratory rate and character. A tracheostomy tray and suction apparatus should be available even after the patient is transferred from the recovery room or intensive care unit. Neurologic assessment is necessary to detect complications associated with postoperative cerebral ischemia and cranial nerve damage. Because ischemia of the myocardium is also a possibility, continuous electrocardiograph monitoring is required. Since blood pressure may be increased by surgery, postoperative hypertension is not uncommon. Carotid endarterectomy. Plaques are removed from the artery to improve blood flow. Modified from Black and Matassarin-Jacobs, 2001.
carotid sinus syndrome syncope sometimes associated with convulsive seizures due to overactivity of the carotid sinus reflex. In certain susceptible persons the carotid sinus is too easily stimulated and symptoms are produced by sudden turning of the head or the wearing of a tight collar. Transient attacks of numbness or weakness of the face, arm, or leg, headache, and in some cases aphasia may also occur. The condition most commonly affects older males and may be a cause of unexplained falls. Diagnosis can be confirmed by a gentle massage of the carotid sinus area of a patient under monitoring. asystole for longer than 3 seconds or a reduction in systolic blood pressure of more than 500 mm Hg are considered positive indications. The syndrome can be subdivided into cardioinhibitory, vasodepressor, and mixed types. Dual chamber cardiac pacing is indicated in the cardioinhibitory and mixed types. Patients who have this condition should be educated to avoid triggering events. excision of occluding material, including intima and most of the media, from the carotid a.
surgical excision of atheromatous segments of the endothelium and tunica media of the carotid artery, leaving a smooth tissue lining and facilitating blood flow through the vessel. The surgery is done to decrease the risk of stroke. Neurology Removal of atherosclerotic plaque by “scraping” the vascular intima of the carotid arteries to ↓ risk of CVAs and TIAs. See Stroke, Transient ischemic attack. A surgical procedure to widen the lumen of a carotid artery narrowed by ATHEROSCLEROSIS. Preoperative assessment is by duplex ultrasound, magnetic resonance angiography (MRA) and CT angiography. The vessel is clamped and opened with a longitudinal incision and the atherosclerotic plages removed. The effectiveness of the procedure depends largely on how extensively the state of branches of the carotids higher up towards the brain are affected. Carotid stenosis may be caused by a wafer-thin fibrous diaphragm. Trials suggest that this procedure is at least as effective as carotid angioplasty and stenting. Subtle brain damage cannot be detected by measuring neuron-specific enolase and S-100beta protein after carotid endarterectomy. A discount can be asked before order a copy of Carotid Endarterectomy market report @ http://www. Defective cerebrovascular autoregulation after carotid endarterectomy. Carotid endarterectomy after recent cerebral infarction. In six studies between 1998 and 2010, the cost of carotid artery stenting exceeded that of carotid endarterectomy by 5%-118%, Dr.
cacy of carotid endarterectomy for asymptomatic carotid stenosis. Carotid artery stenting as compared with carotid endarterectomy was associated with a 19 percent increase in the risk of such an outcome, as well as an increased risk of various combinations of strokes, ipsilateral stroke and death. Carotid artery occlusive disease is responsible for approximately 20% to 30% of strokes (1), and carotid endarterectomy (CEA) has been proven effective in reducing this risk of stroke in symptomatic and asymptomatic patients with >60% carotid stenosis (2, 3). Intervention entails carotid endarterectomy (CEA) or carotid stent placement (CAS). The neurologist should have ordered an urgent carotid endarterectomy, which would have prevented a major stroke. The performance and exceptional handling characteristics of our tissue products make them appropriate for a number of vascular applications, including carotid endarterectomy, which should complement LeMaitre Vascular's gold-standard Pruitt-Inahara Carotid Shunt line.